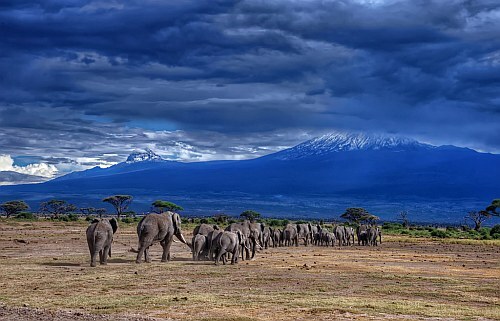 Turkish Airlines has dropped the price of their flights from Toronto to Kilimanjaro, Tanzania down to $877 CAD roundtrip including taxes. The flights have just 1 stop each way, in Istanbul, and are pretty close to as fast as Toronto - Kilimanjaro can be done. You can also turn these into 2-in-1 trips, and visit both Istanbul, Turkey *and* Kilimanjaro, Tanzania for $40 more. You can also find 2-in-1 trips with Istanbul, Turkey and Johannesburg, South Africa for a similar price. Click on the departure date box to open up the calendar view and browse for cheaper date combinations. You can also reverse the order of visiting Istanbul and Kilimanjaro, if you'd rather visit Kilimanjaro first. 4. For the first and third legs, try using dates from the list of regular roundtrip flights above. Then play around with the middle date, to give you more or less time in Istanbul vs Kilimanjaro. You can also find 2-in-1 trips with Istanbul, Turkey and Johannesburg, South Africa for a similar price ($913 CAD). The flights are non-stop from Toronto to Istanbul, and from Istanbul to Johannesburg. But they have 1 stop in Istanbul on the way home for about 10 hours. You can also find regular roundtrip flights from Toronto to Johannesburg, South Africa for slightly less - but they have a long layover in Istanbul both ways. Try the dates listed below. But if you're not taking advantage of the stopover in Istanbul, you might be better off with faster roundtrip flights to Johannesburg. toronto, yyz, flight deals, africa, eastern africa, turkish airlines, kilimanjaro, tanzania and jro.